If you read the recent press release from the New Jersey Board of Public Utilities (NJBPU), NEW JERSEY HIGHLIGHTS SUCCESS OF SOLAR MARKET, you might believe New Jersey’s Clean Energy Program™ (NJCEP, http://www.njcep.com) was a model of flawless execution in 2006. 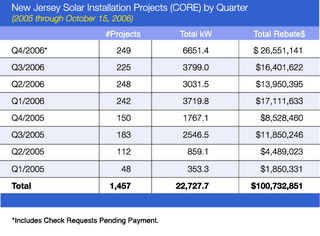 Likewise, the above chart of New Jersey Solar Installation Projects (CORE) by Quarter shows a slight drop in projects but an increase in Total kWp system capacity installed this summer 2006. Actual NJCEP reality is reflected in the article, The Price of Success: Inside the NJ Clean Energy Program, by Stephen Lacey on RenewableEnergyAccess.com. The Date of Approval Letter field in the latest CORE Queue <= 10kw Nov 22, 2006, shows no solar rebate applications were approved or checks issued from June 15, 2006, until September 29, 2006. The approvals for Q3/2006 were back end loaded to the absolute last business day of September 2006. The CORE Queue Less Than 10kWp has more than doubled since May 2006, but just over one third of the backlog has been addressed. Although the Date of Approval Letter field is not included in the CORE Queue Greater than 10kWp, any recent approvals occurred after the last CORE Queue release on September 15, 2006. Talking with solar system installers and integrators at Solar Power 2006, I heard some scuttlebutt that the NJCEP program was being audited during the rebate freeze, allegedly because of “Pay to Play” concerns that have permeated New Jersey politics. I can only wonder what prompted the NJCEP to worry about New Jersey solar module shrinkage as reported in Gossip and Rumors from Solar Power 2006. Has there been a black market in rebated New Jersey solar modules? I think NJCEP has done great work to promote solar and renewable energy in New Jersey, but they shouldn’t gloss over sustainable program growth issues with a press release. This sort of delay is why I think the rental business model for Citizenre will be successful in the short term.